This elm has been written about here before. I will gloss over the past details and just show a few progression shots for clarity. 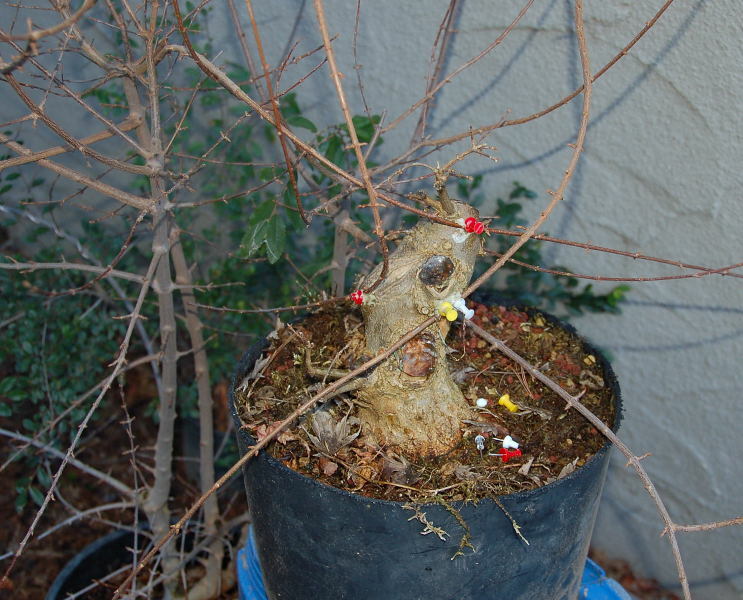 This was the stump as dug from the tree farm ( Steve DaSilva ) in Feb. of 2013. Over the next few years the branches were styled and given some shape. 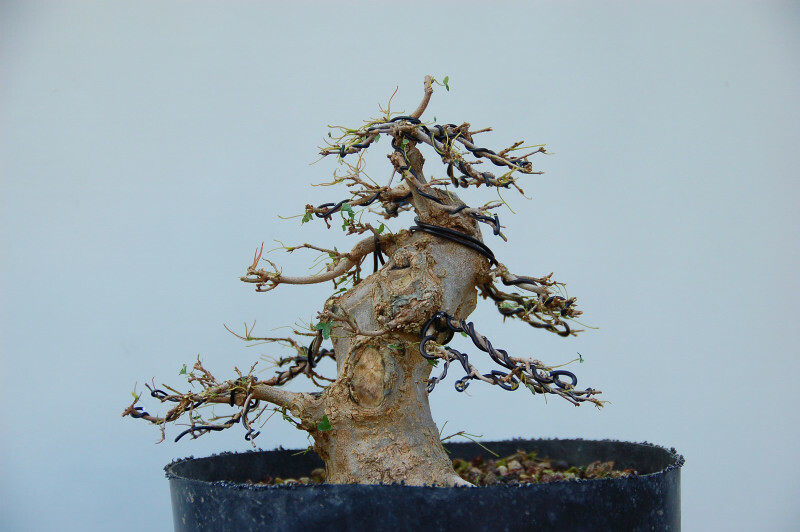 Fast growing meant cutting in of the wire many times and some scarring can be seen giving some character to the branches. I decided that the tree was about as far as I could take it as it was. 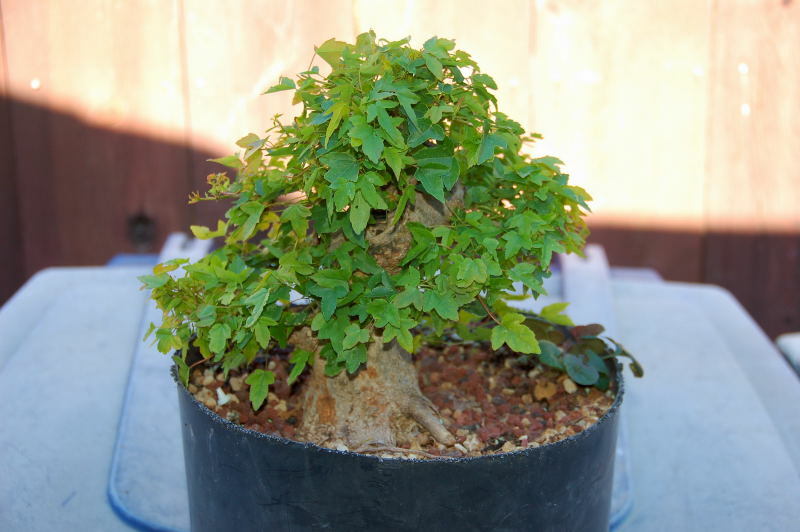 I would either have to layer the tree reserving the top portion as a good Moyogi tree and then work on the bottom and utilize that over a number of years. 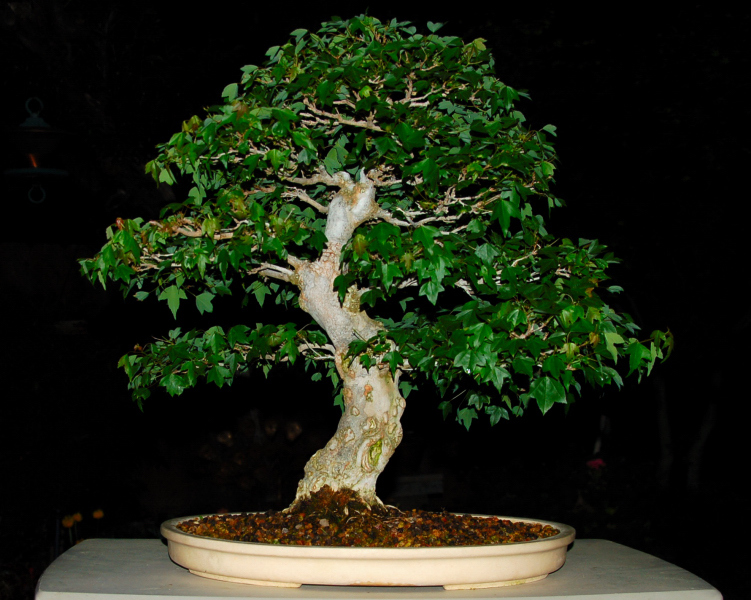 Or, turn it into a sort of Bunjin tree because of its long trunk with special branching near the top. I thought the Bunjin style may be worth the effort so most of the branches on the lower half were removed. I applied about 8 guy wires to the tree in an effort to pull down the branches to get the necessary effect of an older looking tree. The tree has its short comings as far as a bunjin styled tree. First the trunk is quite large. It is not easily seen in the photo but is nearly three inches across at the base. About half way up, the tree had been chopped for a direction change and some necessary taper in the trunk. What it did was build shoulders on the chop. This gives the impression of two cylinders on top of each other. While the top third shows much more taper due to the fact that I was able to control the growth in a container rather than in the ground. 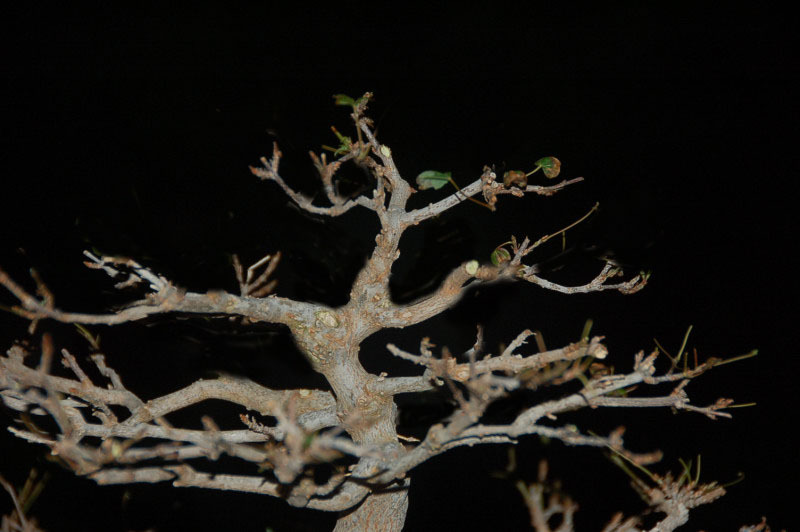 A picture of the tree during its naked X-rated photo shoot! 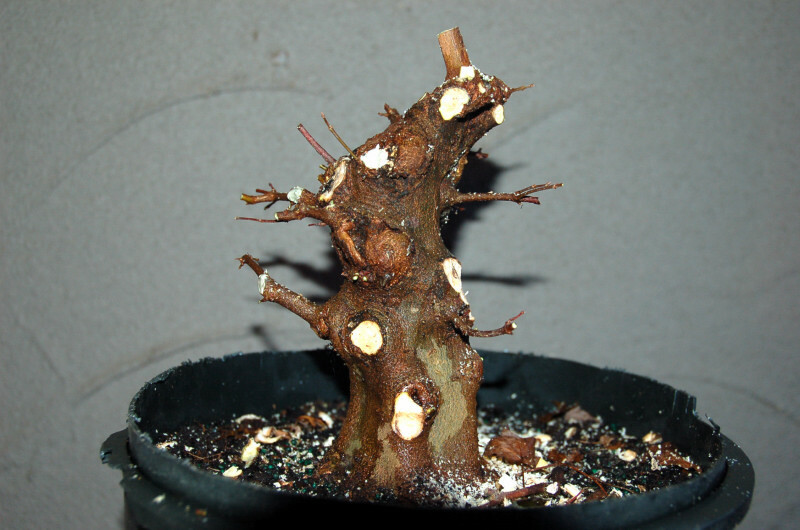 This bark was removed from some places to get the necessary taper that would improve the overall look of the trunk. This large lump will have to be worked on to smooth out the bump. These old scars and the new ones as well will need some work to make them a part of the feeling of the tree. I began by carving some interest into all the old stubs. Some were carved and some just smoothed. I had three choices for Literati pots to choose from. The two shallow ones are from Japan and the other is a local potted. There are no feet on the pot and it will sit directly on the wire. I just cut a piece of screen to fill the entire bottom and allow the ties wires to do the holding in place of the screen. 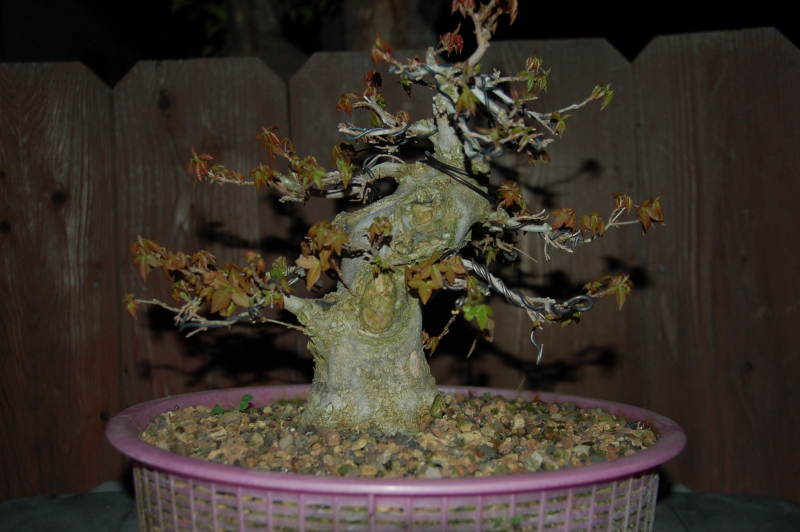 After pruning and root pruning the tree was tied into it’s new pot. For the guy wires I use a 24 gauge steel wire that is anodized black. I thread that thru 3/32 shrink tube for protection on the branch. It’s all very small and barely visible. The guy wires are attached to small 1/4 inch brass screw eyes that I thread in along areas not readily seen from the front. The final result. So far reception has been OK but still not Bunjin. People still feel the trunk is too big. When seen in person that feeling is not present. 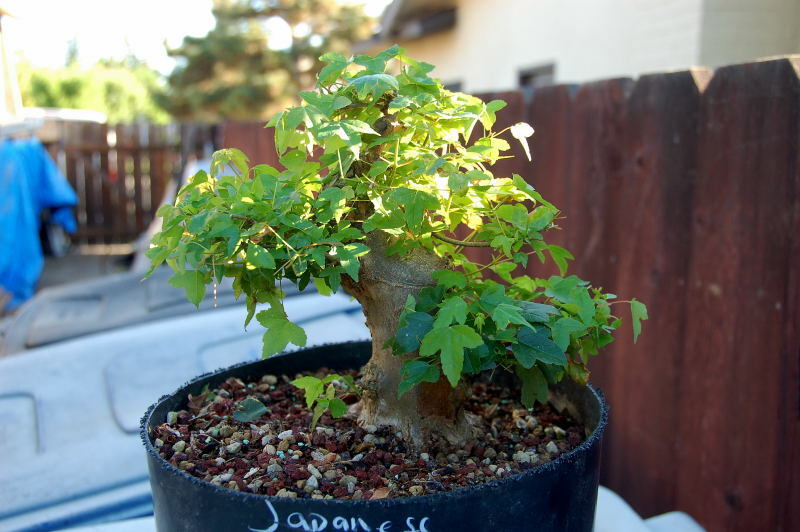 This trident maple started life as a bare root tree in a shopping bag at a Fresno Bonsai Society swap meet. The Grower is Ed Clark.Very tough to see any trunk line in this bagged tree, but I saw a decent line and thought I could improve it. 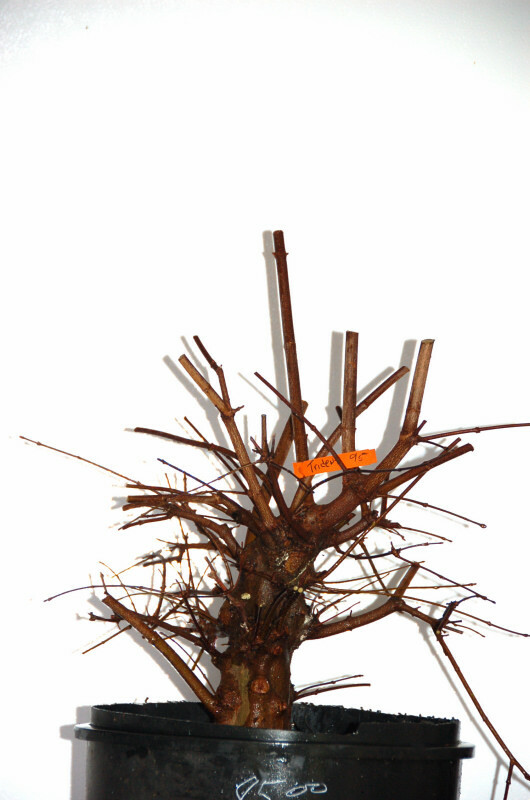 The tree was pruned back very hard and planted in a cut down pond basket. Some wire was used to preserve what branches I did keep. The tree went on to be used for a demo in what I called livin in “realville”. The shorter story can be read elsewhere on this blog. 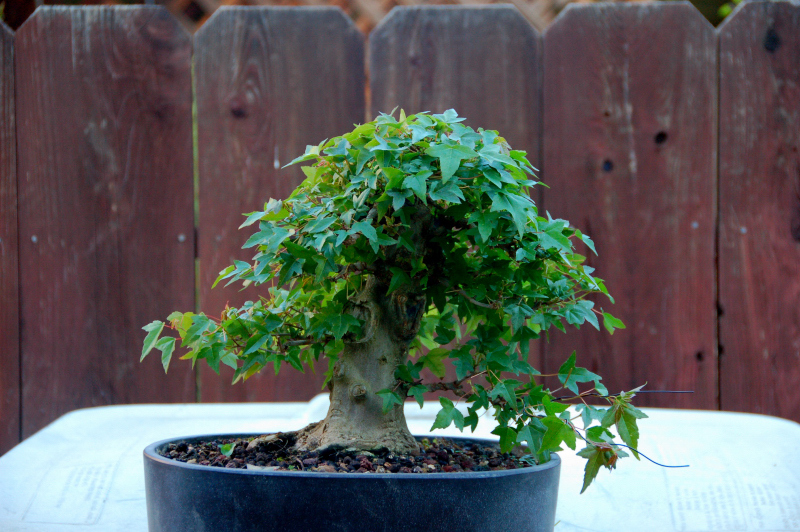 The contention was that sooner or later every person working with bonsai has to make decisions on which pieces of material to keep and which to find a suitable home for. Hopefully make a few bucks to cover your trouble. The premise was which of the two was the better one to waste ones time on. I kept the one on the right and sold off the other. I decided to make a virtual of the future of the tree. This was all going on with the 2010 purchase and repotting in 2011. 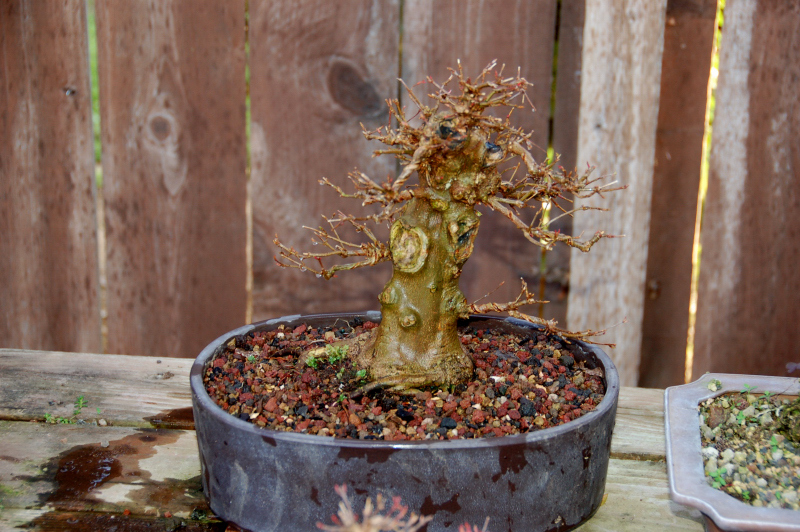 During that repotting combing of the roots and checking out the deep undercut that was in the lower trunk. 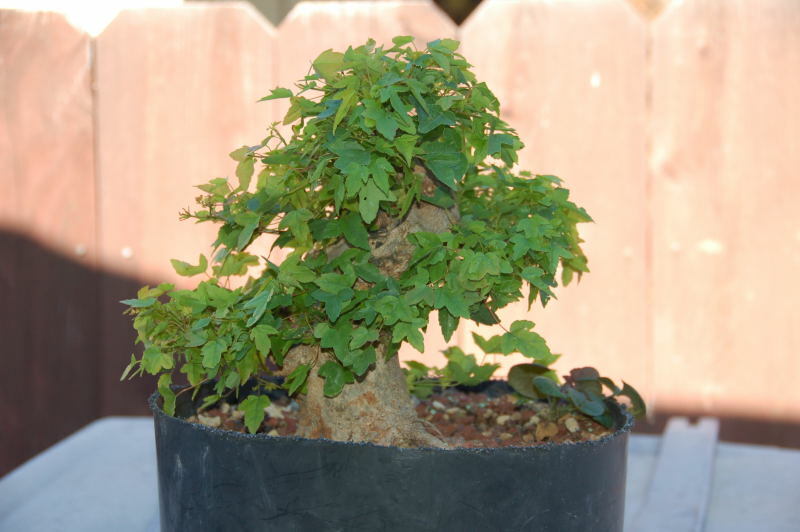 It grew well, but the hot summers of the Central valley drought took its toll on the leaves and strength of the tree. Here is a good shot of the undercut portion of the trunk. For the tree to look like anything this would have to be addressed and soon! 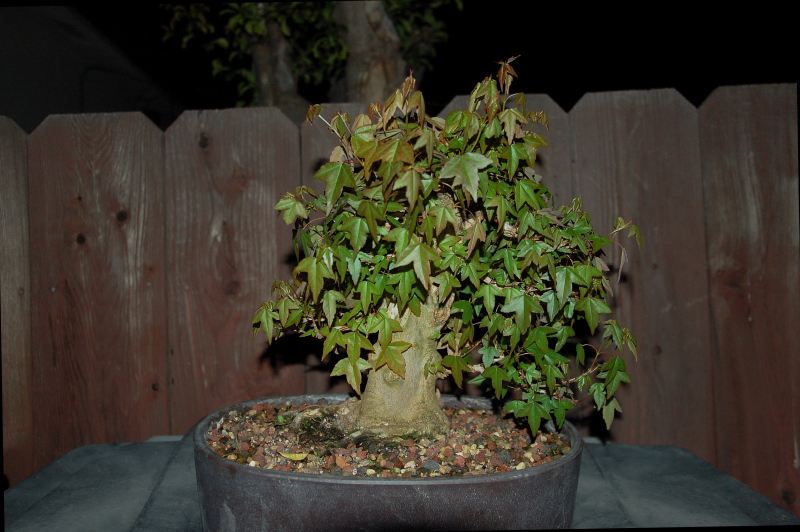 During the growing phase I kept it pruned back hard on the top and tried to keep the growth in the lower portion of the tree. Very hard to do on a trident. During the winter of 2012 I decided it was time to address the undercutting. 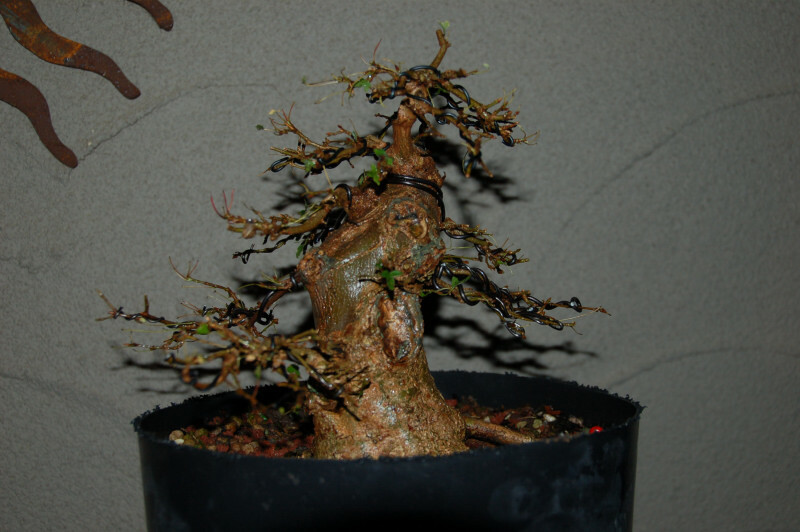 I used some cutting that had rooted from the previous year, and wood thread graft them thru the trunk. 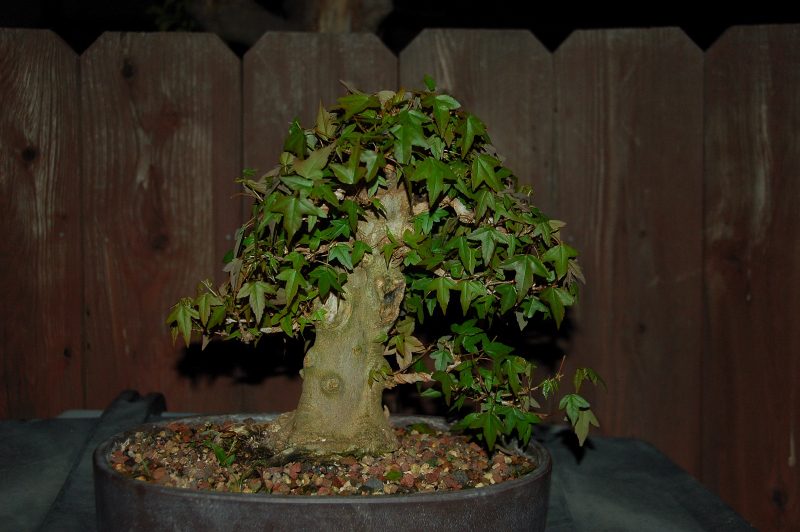 I also approach grafted four branches on the upper trunk. All the grafts took. 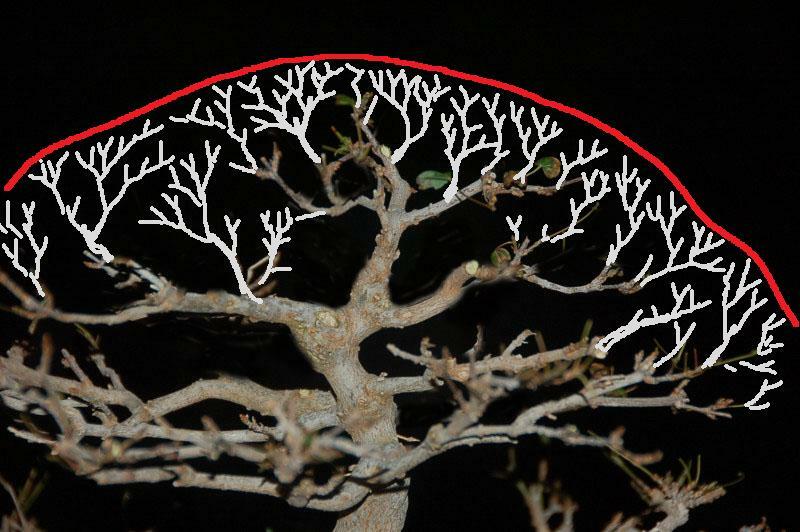 There is one in the center of the trunk which looks like a curving branch. 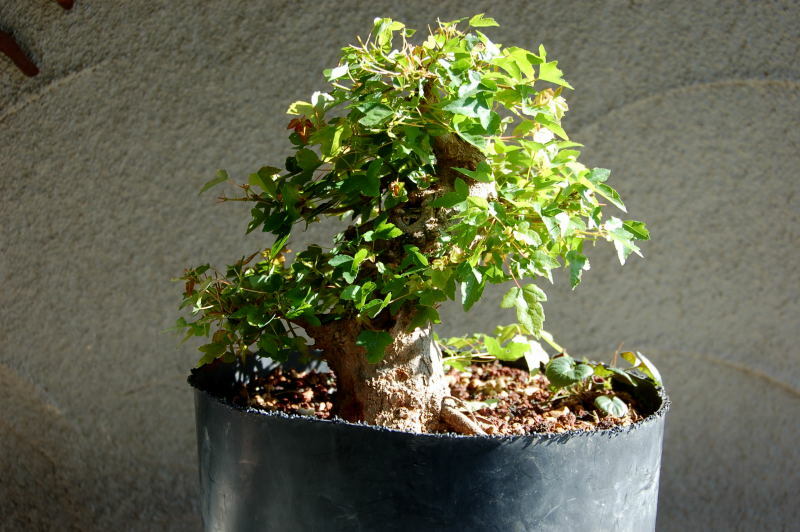 The tree grew well and the treatment was the same, cutting back the top to allow the bottom to grow and strengthen. 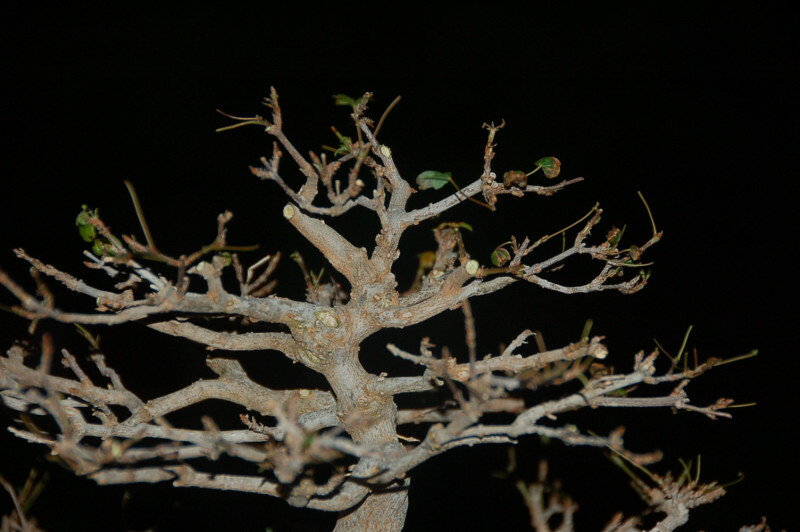 The lower right branch is one of the grafts. Two years ago I decided the tree was too tall for shohin. Using the stick I made for size limits, we can see the tree is about 1.5 inches too tall. All along the process this has been my front view of the tree. It received some massive squirrel damage in 2012 and I did not like the look of the trunk after the damage. A close up view of my stick. A layer was the only option left to fix the trunk. 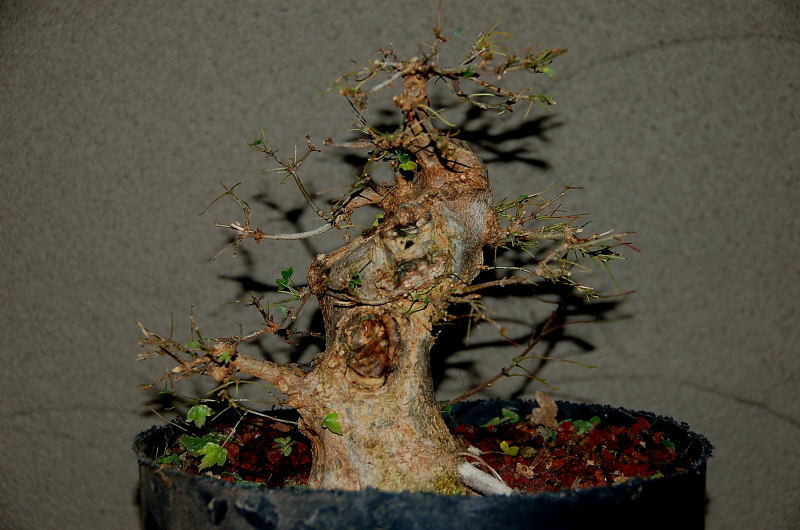 This would not only get the tree down to the correct size, but would also improve the undercut side of the trunk which had failed with the thread grafts. The black line was drawn on the trunk and the incisions were made. 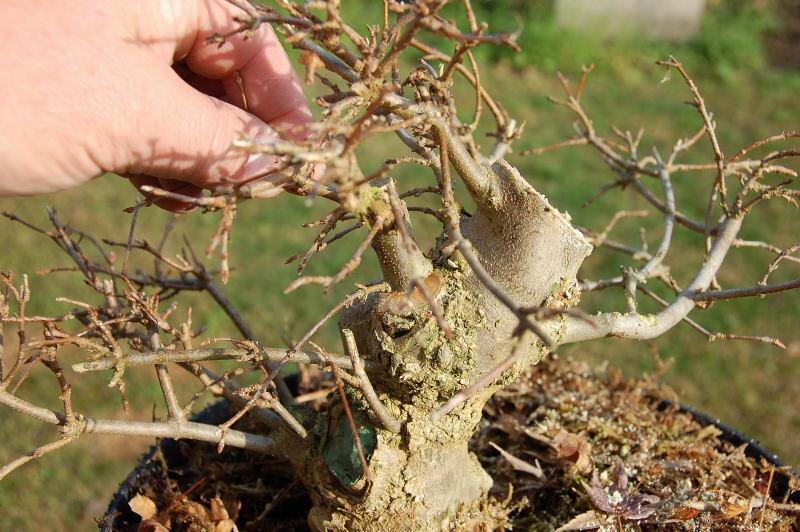 At the top of the cut I added a large piece of wire around the cut to insure the roots growing outward from the trunk. After a few weeks, sprouts were coming from the trunk. The wire can just be seen in the photo. After about 75 days the entire root process stopped. 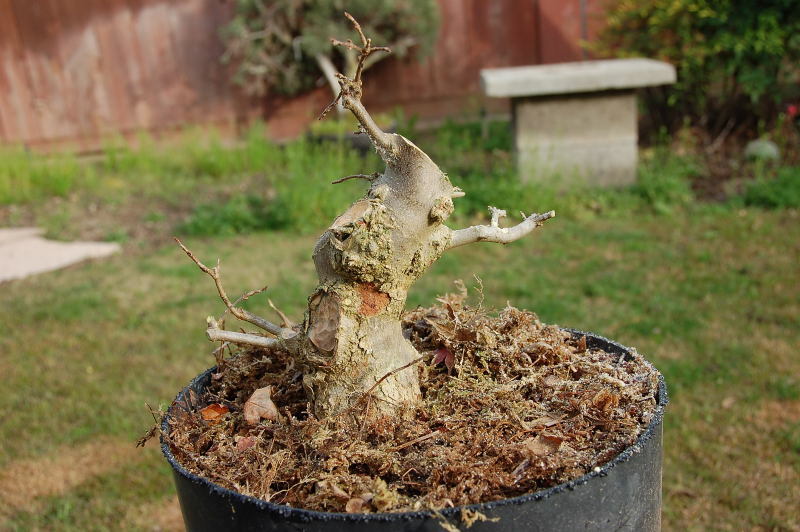 I uncovered the trunk and found that the tissue had bridged and was growing just fine stopping the rootage from growing. I took a sharp knife and cut away all the live wood and allowed it to sit for a couple days open to the air. Then re-buried it. I allowed free reign now since the roots were growing well. It grew all summer of 2015. 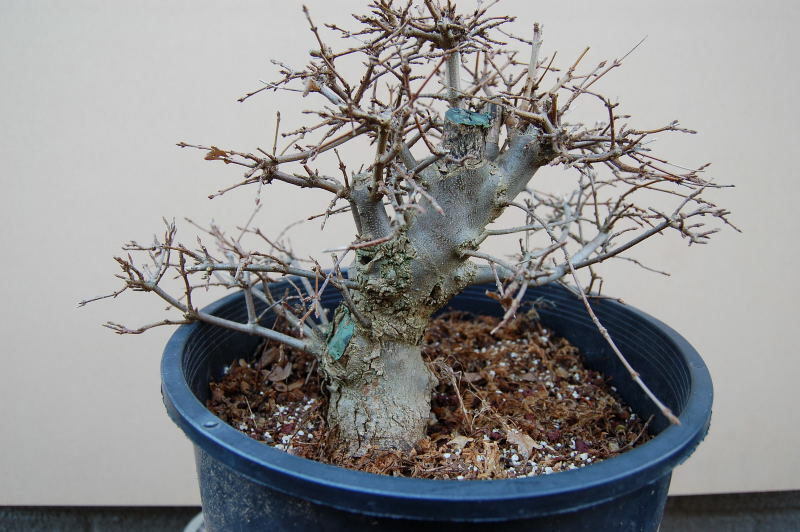 Pruning continued during the appropriate times to not lose the size of branches within the canopy. 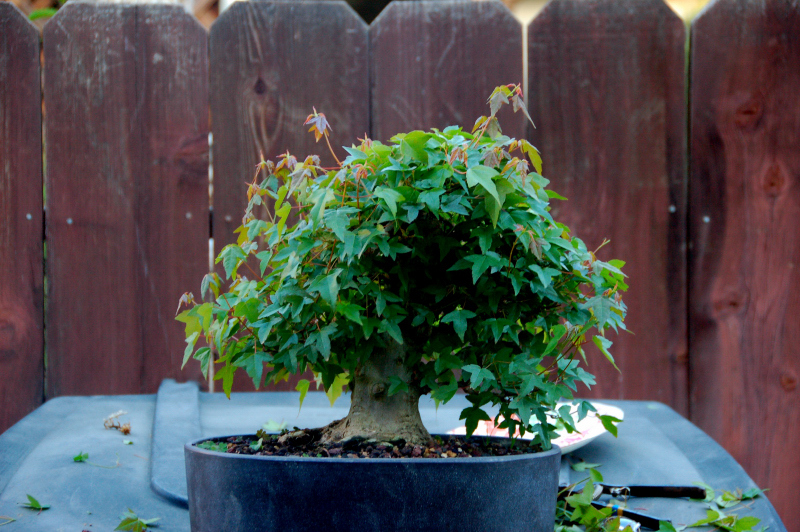 Winter of 2016 and time to cut it off the stump and pot it into a new bonsai pot. I layered in winter of 2014 and allowed it to grow all of 2015. In spring of 2016 this is the root ball I had growing in the colander for one year. 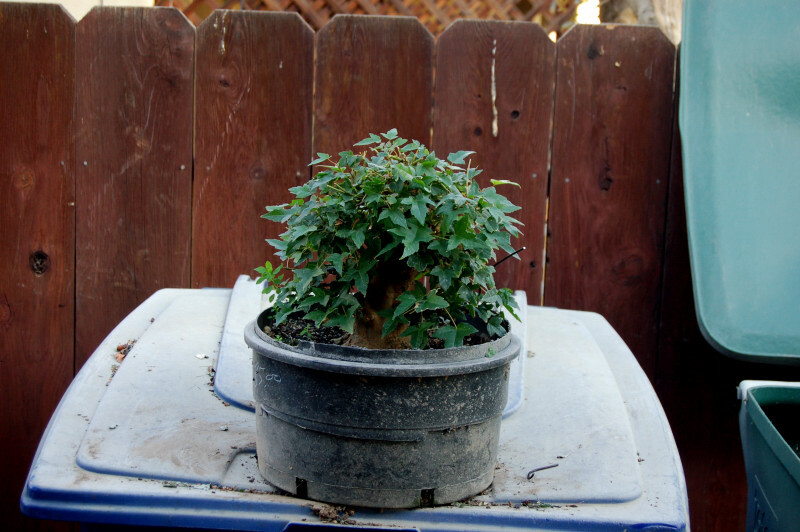 The tree had been growing on an inverted terra cotta water dish to keep the root pad shallow. 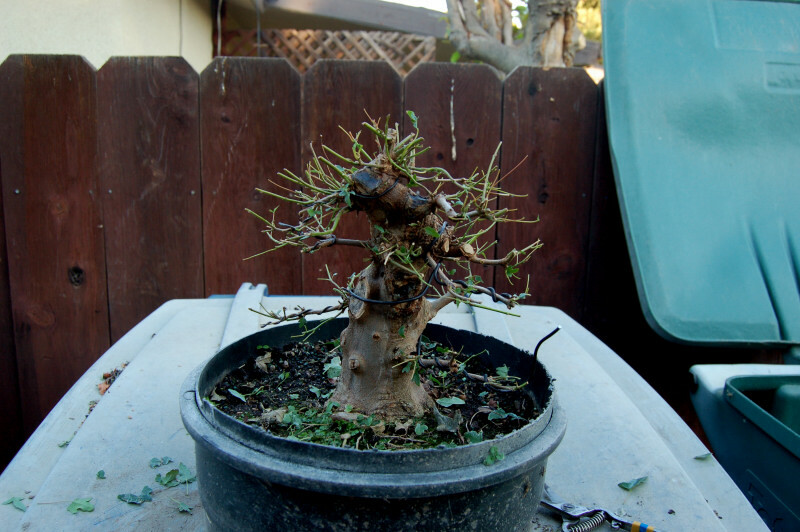 Here is what I kept after pruning back the root pad and spreading it out. Good radial root spread with roots all the way around. 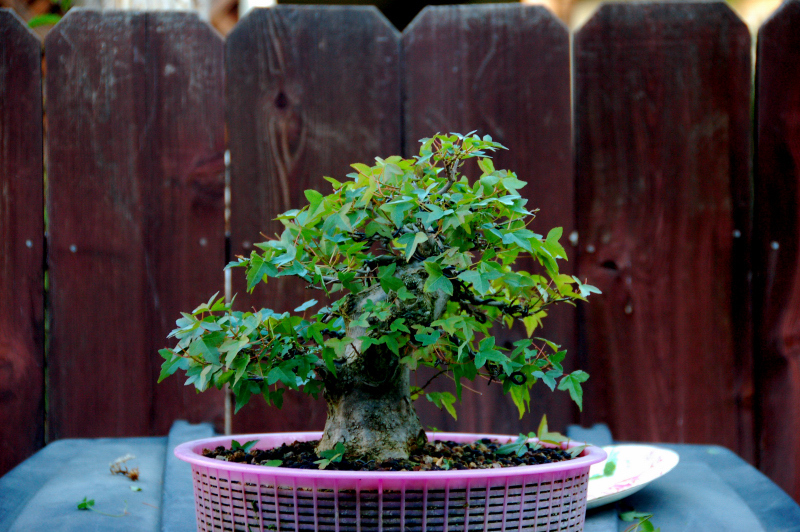 Potted in a light blue Yamaki lotus shaped Shohin pot. Tonight the first pruning was done. All the branches were cut back to a pair.